In other words, everybody’s got something to teach you. It’s like deep water in a well, and you’ve got to draw it out of them. ”People’s thoughts can be like a deep well, but someone with understanding can find the wisdom there” (Proverbs 20:5 NCV). 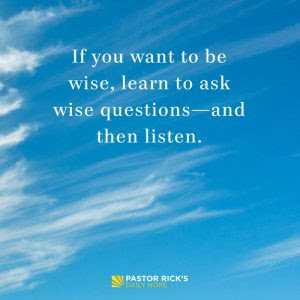 If you want to be wise, learn to ask wise questions—and then listen. Proverbs 20:5 says, “People’s thoughts can be like a deep well, but someone with understanding can find the wisdom there” (NCV). In other words, everybody’s got something to teach you. It’s like deep water in a well, and you’ve got to draw it out of them. How do you draw the wisdom out of every person? By learning to ask smart questions. As I’ve traveled around the world, I’ve asked questions of taxi cab drivers and prime ministers, and they’ve each taught me something. You can learn from anybody if you know the right questions to ask! One of the things I’ve learned is that I have never learned anything while I’m talking. If my mouth is moving, I’m not learning. You don’t learn when you’re talking. You learn when you’re listening. So you’ve got to learn to listen. I’ve done an awful lot of interviews over the years, and I’ve noticed that the interview shows have changed. They’re no longer about the guest. They’re about the interviewer. The whole goal of the interviewer is to draw attention to himself. You can learn from anybody, but you’ve got to be willing to ask questions and then listen. That’s the mark of a wise person. Try to spend a whole day focused on listening rather than talking. What difference does it make? What do you communicate to someone when you ask a question and then listen to the answer with focus and interest? What would be an example of wise question?